Jonas T Johnson, John K Nipaeko, Paul A Levine, David W Kennedy, Pete Weber, Randal S Weber, Michael S Benninger, Richard M Rosenfeld, Robert J Ruben, Richard J H Smith, Robert Thayer Sataloff, Neil Weir,	The Journal of Laryngology & Otology, Volume 121 Issue 7, pp 613-614. 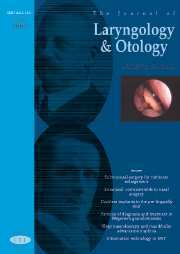 S E J Farmer, R Eccles,	The Journal of Laryngology & Otology, Volume 121 Issue 7, pp 615-622. P J P Goonetilleke, D J Gatland,	The Journal of Laryngology & Otology, Volume 121 Issue 7, pp 623-629. T S Chimona, J G Panayiotides, C E Papadakis, E S Helidonis, G A Velegrakis,	The Journal of Laryngology & Otology, Volume 121 Issue 7, pp 630-634. A Daneshi, S Hassanzadeh,	The Journal of Laryngology & Otology, Volume 121 Issue 7, pp 635-638. N N Mathur, R Dhawan,	The Journal of Laryngology & Otology, Volume 121 Issue 7, pp 639-643. R Xu, G Xu, J Shi, W Wen,	The Journal of Laryngology & Otology, Volume 121 Issue 7, pp 644-649. Sino-nasal assessment questionnaire: a specific outcome measure for rhinosinusitis, but what is the range in the asymptomatic population? F Younis, S Duvvi, T Walker, B Nirmal Kumar,	The Journal of Laryngology & Otology, Volume 121 Issue 7, pp 650-652. I A Srouji, P Andrews, C Edwards, V J Lund,	The Journal of Laryngology & Otology, Volume 121 Issue 7, pp 653-658. B Devlin, K Golchin, R Adair,	The Journal of Laryngology & Otology, Volume 121 Issue 7, pp 659-663. D Cohen, Y Gurvitz, P Friedman, D Raveh, R Perez,	The Journal of Laryngology & Otology, Volume 121 Issue 7, pp 664-667. A Johal, M P Hector, J M Battagel, B T Kotecha,	The Journal of Laryngology & Otology, Volume 121 Issue 7, pp 668-675. D Tamiolakis, E Proimos, G E Perogamvrakis, C E Skoulakis, G C Georgiou, C E Papadakis,	The Journal of Laryngology & Otology, Volume 121 Issue 7, pp 676-679. C A Foster, P Jabbour,	The Journal of Laryngology & Otology, Volume 121 Issue 7, pp 680-683. H Y Ching, N Eze, V Moore-Gillon,	The Journal of Laryngology & Otology, Volume 121 Issue 7, pp 684-686. Information technology in ENT: are we ready to be ‘Connected For Health’? P J Clamp, P Virdi, A Vats, D D Pothier,	The Journal of Laryngology & Otology, Volume 121 Issue 7, pp 687-691. L M Brown, B Wallwork,	The Journal of Laryngology & Otology, Volume 121 Issue 7, pp 692-694. J S Phillips, D R Pledger, A W Hilger,	The Journal of Laryngology & Otology, Volume 121 Issue 7, pp 695-697. B Buerke, B Tombach, W Stoll, W Heindel, T Niederstadt,	The Journal of Laryngology & Otology, Volume 121 Issue 7, pp 698-701. S Vaidyanathan, R Capper, D Chadha,	The Journal of Laryngology & Otology, Volume 121 Issue 7, pp 1-2. The Journal of Laryngology & Otology, Volume 121 Issue 7, pp 1-6. P Bonfils, P Avan, P Palimi, D Malinvaud,	The Journal of Laryngology & Otology, Volume 121 Issue 7, pp 1-4.